At the end of the movie, where is Susan and her monsters going on the Butterflyasuras to? What monster should Ginormica end up with? Would you like she crushed Derek? Would you like Ginormica to be taller? Why doesn't Ginormica have more fans? a poll was added: At the end of the movie, where is Susan and her monsters going on the Butterflyasuras to? a comment was made to the question: Why doesn't Ginormica have more fans? How did Ginormica get so big? 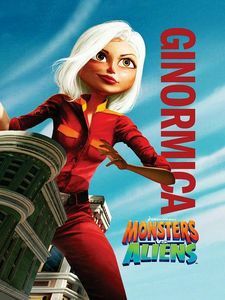 Does Ginormica cry in this movie?